Inspired by a blog buddy, I finally took steps to tidy-up the saddlebag. My relatively weighty tool roll tended to end up at the bottom center of my bag, causing a distorting sag and a bit of sway during standing climbs. It was oddly always in the way while trying to access things that are used more frequently. Remembering that I saw Bike Tinker attach his minipump to his bag’s support bar, I grabbed a toe strap and cinched it up. Tidy, stable, and out of the way. So far so good. Now I need to give some thought to the sometimes rattle-y handlebar bag. Great idea! I used to put a mini pump in the same way, but I've forgotten about it over the years. Thanks for reminding me. Ah yes, the rattle-y. 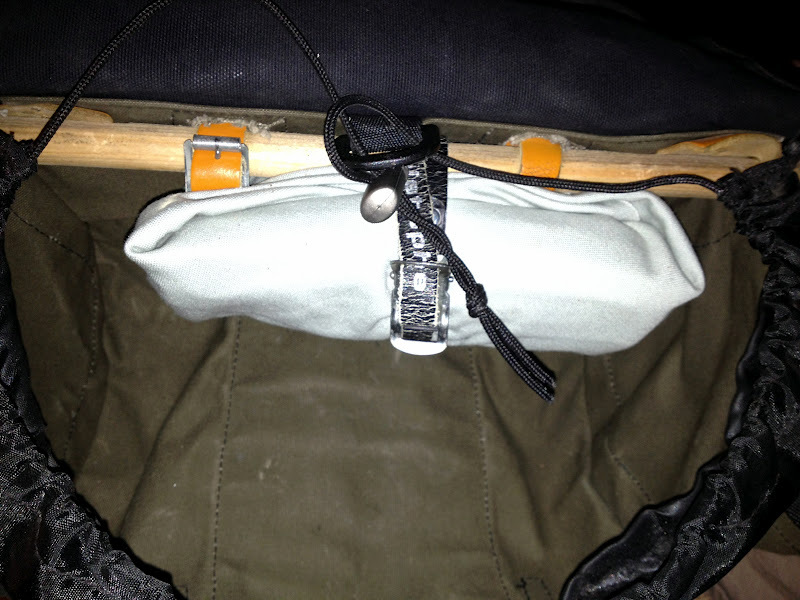 I wrap my offending items in the handlebar bag with old inner tube pieces or electrical tape. Also have found that putting items in small bags that just barely hold them seems to help. Good luck. That's a great idea! We've always got something rattling around in the front bag of the tandem…and it drives me nuts!